When a child comes into the world, we spend ample time considering how to protect and prepare them for the life ahead. For most, creating a plan that incrementally saves for big ticket items like education, possible medical needs or celebratory events is part of every parent’s job. As we anticipate the trajectory of their life, we must also consider the rapid pace of technology, changing industries and global events that impact our, and their, financial futures. We must factor in how costs will rise over the next 18 years. Consider this: the cost of college has increased a whopping 213% since 1988 alone. In 2017, CNN reported the price tag of a four-year bachelor’s degree today from a private non-profit college to be $104,400 (estimated by the College Board), assuming the student did not encounter any delays graduating. But, we know all too well that many schools cost more than that. That Harvard education? It now comes with a price tag of $70,000 per year. Assuming those costs stay fixed (and we know they won’t), a single degree will cost $270,320. Interested in Stanford? Try $67,000 for the 2018-19 school year. So, how can we make the right decisions now to help save tax dollars, and ensure financial stability? Pay directly, when you can. First, understand that it is always in one’s best interest to pay an educational institution directly. For a college or university, there are no limits on the amount of money that can be paid, and it’s considered a non-taxable event. For elementary and secondary schools, there is a $10,000 annual cap on amounts paid. And while it’s considered the best case scenario to pay as much as possible up front, no one knows what the future holds for any individual’s ability to pay directly. 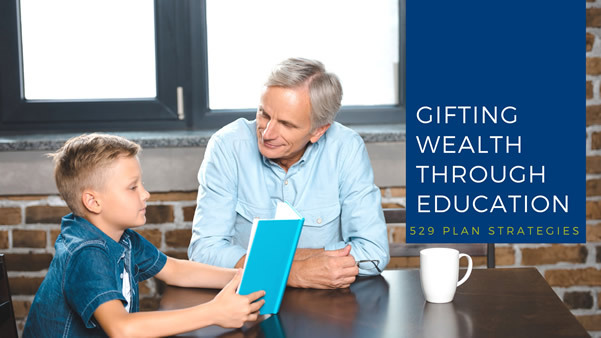 So in that spirit, one of the most powerful tools for helping save for a child’s educational expenses is the 529 college savings plan. A 529 behaves like an IRA in that it uses after tax dollars, which will never again be taxed as long as they are used for educational purposes. Always considered a helpful tool, the 529 was greatly enriched with the 2017 passage of the Tax Cuts and Jobs Act. Here’s our strategic advice on how to make the 529 work for you. Front Load. 529 account holders (including grandparents) are allowed to max out contributions in the first year. Normally, each parent is allowed to contribute $15,000 per child, per year (for a two-parent household that means $30,000 annually). However, upon opening the account, households can contribute 5 times the maximum contribution. That means up to $150,000 in year one, and then letting it sit for five years with no further contributions. Starting in year six, and moving forward, account holders can revert back to the $15,000 per parent contribution on an annual basis. Let It Grow. That said, if you do front load, you are harnessing enormous earning potential over the course of a few decades as you wait for your investment to mature. Understand Your Options. The new tax law also enables families to use funds in the plan to pay for private elementary and high school, not just college expenses. So, should you need funds sooner, you are covered. It is good to note, however, that elementary and secondary school payments are capped at $10,000 per year. Beneficiaries Can Transfer. As long as you do not have children who will overlap in funding needs (such as children who would attend college in the same time period), once one child is done using the money, you can change the beneficiary from the first to the second child. Or, perhaps extend it to other family members or future generations, the choice is yours. Thinking Long Term. If your investment grows beyond what is needed for an immediate family, you can also extend it to future generations. Consider Nevada. Whittier Trust’s Nevada Tax Advantage has plenty to offer, and in the case of education, a family may elect to establish an education trust and/or include other specific trust purposes to cover health, education, maintenance and support, which would allow several generations to reap the benefits over time. Paying for a child or family member’s education is indeed one of the greatest ways to gift wealth. Thanks to recent Congressional action, it’s now much more beneficial.